For an equally complicated explanation, click here. 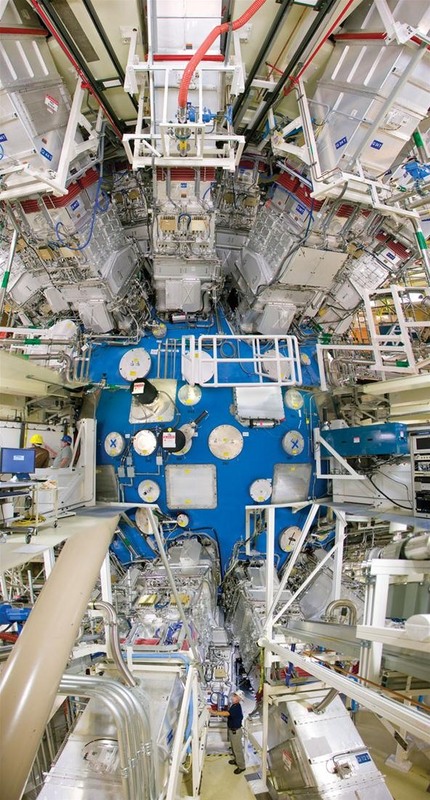 Basically, NIF aims to create usable, manageable fusion in a small, confined space. How difficult is this? Extremely difficult. 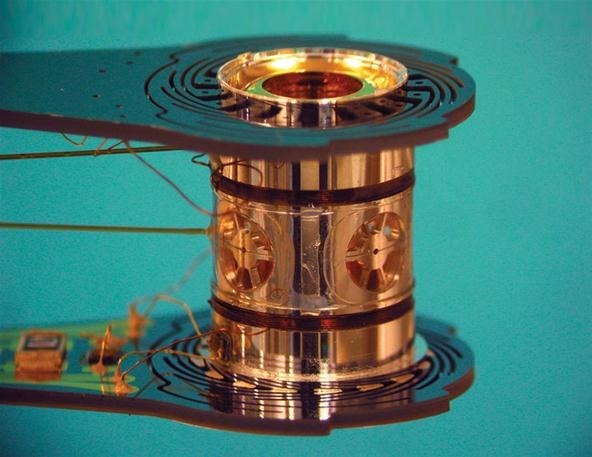 The NIF, if functioning as desired, would be giving birth to a small sun in a metal sphere. 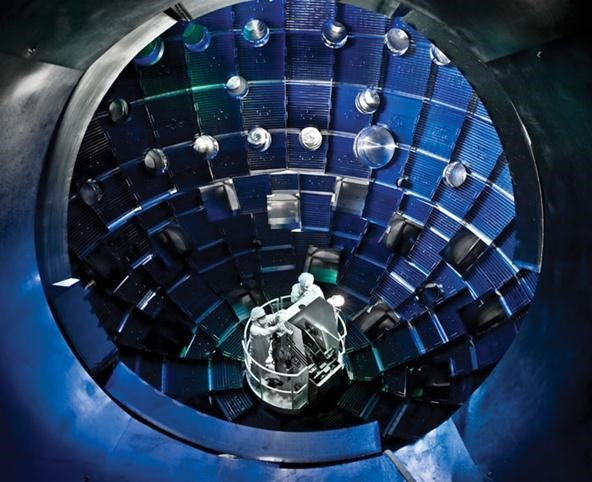 The potential for nuclear fusion is profound; if this project succeeds, it could end the world energy crisis. Conceptually, the only fuel needed would be salt water, and a lot of laser energy. 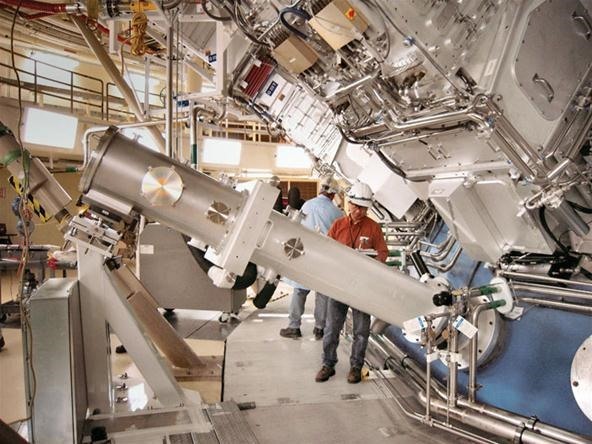 Ideally, the reaction itself would be enough to provide energy for the function of the lasers, as well as provide plenty of energy left over for practical use. For more information, photos and more, see their website here. I have to say, the precision construction of that hahlraum is really beautiful with its spiraled mounts and polished finish. I visited the facility when they were building it. I think it was in 2002. Amazingly impressive. The lasers themselves are housed in a building that is about the size of a football stadium. The chamber itself really does feel like something from Star Wars when you're inside it. The stated purpose of the facility is actually weapons research...so we don't have to do underground tests of thermonuclear warheads. Hopefully there will be many other benefits to the facility. I thought that this chamber was to create fusion between the hydrogen coils then maybe get return energy by the fusion of the hydrogen? Basically the funding for the facility pretty much exists because of weapons testing...that doesn't mean a lot of other experiments won't be done as well. As long as they know what they're doing and don't accidentally make our planet self implode! it has to do a lot with politics. during the cold war, there was a fear that if another nation surpassed the US in military might, they would impose their ideology upon everyone. so therefore, instead of concentrating on free energy, or the like, many US scientists were focusing on military might instead of more energy related stuff. I guess that the cold war fever still lasts today, and the government still has to keep ahead of everyone else in the military game.